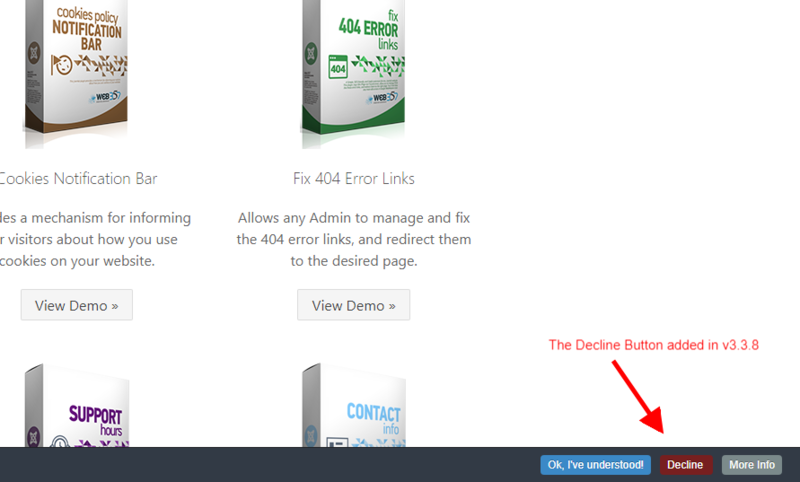 + NEW BUTTON: The "Decline" button has been added to the notification bar. And of course is multilingual like other buttons. + NEW PARAMETER: Hide cookies from the cookies table (comma separated). 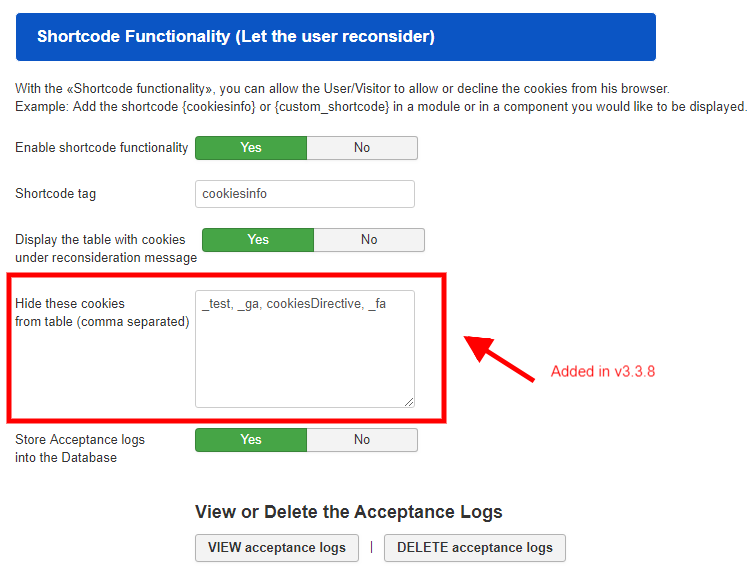 With this new parameter, you can hide some preferred cookies from the table. This option will not block the cookies from the browser, it just hiding them." 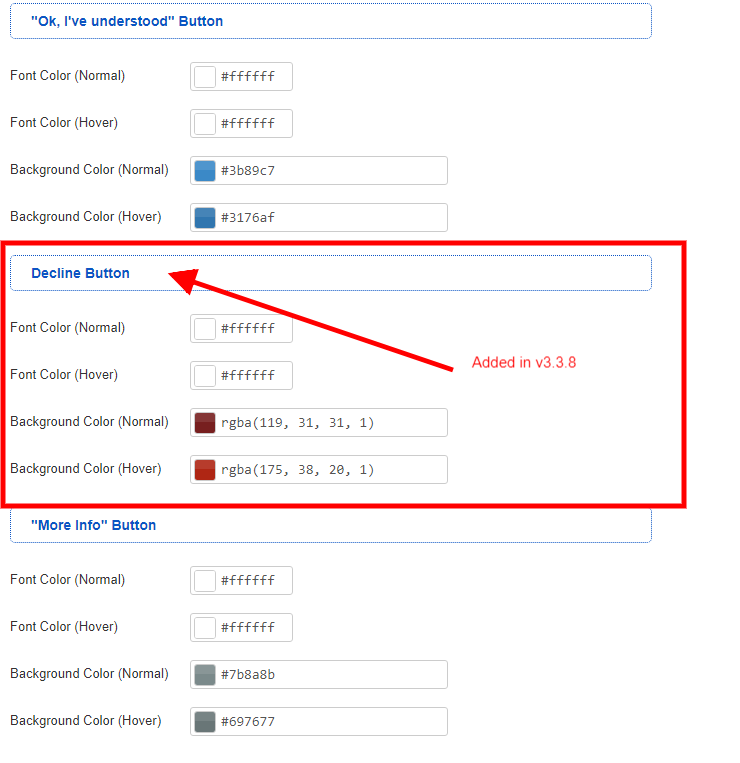 # CSS BUG FIXED: The modal window should be displayed in front of other elements, even the notification bar. # BUG FIXED: Do not return a blank 500 error page, but instead display a warning message if the required extensions 'mbstring' and 'iconv' are disabled from the server. # JS Issue: Check if the cpnb_config variable is defined without any JS errors, and then use it. # BUG FIXED: Some caching issues, after the user accepts the cookies policy, have been resolved. # BUG FIXED: You can change the input texts for languages even if the plugin is not published yet, without lose any translations you've entered before. # Minor bug fixes and code improvements. Hope you found this major release very useful and you will be happy with the new functionalities about EU GDPR Compliance.